This energy-efficient LED panel is ideal for offices, schools, workshops, and stores. The energy consumption is only 29 watts [high lumen], this replaces your current fluorescent lighting and saves you up to 80% on your energy costs! For the business market there has been a new era in the field of lighting! LED Lighting is an important factor for the efficiency and ambience that creates and emits a space. The EUROLEDSTORE LED panels have only advantages over traditional TL fixtures. You get more light, a more beautiful and smoother design, more beautiful even colors, a much lower power consumption with up to 80% reduction on energy costs, long life and 2 year warranty! Thanks to the supplied transformer, you are assured of a simple plug & play installation that will save a lot of installation costs. The installation is easy and fast by everyone, you do not need a specific technical background for this! To make it even easier, you can also order a power cord of 1.5m, supplied with a Eurostick, directly with you. Click the desired product above at " Choose : *" and add the desired product (s) to the shopping cart. - 3000K : warm white, for use in; Offices, shops, hairdressing salons, cellars, stores, hobby spaces, workspaces where something more warmer ambient light is desired. - 4000K : neutral white, for use in; Warehouses, shops, hairdressing salons, cellars, stores, hobby spaces, workshops and industrial areas where neutral light is desired ( most chosen ). - 6400K : daylight white, for use in; Offices, shops, cellars, storage hobbies spaces, workshops, warehouses and industrial areas where there is little or almost no daylight entry. See the table below to choose the right light color. The installation is very simple and there is no need to adjust the system ceiling, even if you do not have a ceiling system, you can easily change our build-up frames to our high-quality LED panels. This means that no installer is required for switching on LED panels. The panels will take up to 20,000 hours. Therefore, you do not have to replace them for years, and your energy and maintenance costs are greatly reduced. The LED panels replace your standard 150 Watt TL luminaires for only 29 watts including power consumption of the transformer! This will save you a lot of energy and get a beautiful even light view, who does not want it now? Energy Saver: With LED Panels, you save up to 80% on your energy costs. Long life: High quality LED panels last a lot longer than standard TL tubes. A standard TL tube will take about 10,000 hours in practice. LED panels take 20,000 hours with a doubling of service life. Less replacement costs: An important advantage of LED panels is that they need to be replaced by the long service life. This will save time and possible hiring of staff. First of all, it is important to know that LED panels only give light on a side instead of around, as with a normal TL tube. Therefore, the amount of light required is less than with a standard TL tube. However, you will see that the amount of light on the surface is even or even more than your old TL tubes. Our LED panels have extra high light output. The higher the number of lumens, the more light an LED panel, our Pro High Lumen LED panels emit no less than 3400 lumens of light and this with only a consumption of only 29 watts, hence these panels fall into the most economical energy class A ++. As a specialized LED trade, EUROLEDSTORE only supplies quality products. For high quality LED panels, we are your right online partner. We can supply the LED panels of your choice in large numbers and do that very quickly, as your order will be delivered within 1 business day , as long as ordered before 16:00. EUROLEDSTORE has specialized in providing professional and high quality LED panels. Due to this specialization and the lack of high overhead in our area of internet wholesale, we can offer all our products at very competitive prices. We therefore give you the guarantee that you pay the lowest price for these quality LED panels! Our prices shown include 21% VAT! Most often, prices are shown on the internet and you will only be charged 21% of the VAT and shipping costs. If your order amount exceeds € 150, - we will ship your order for FREE . The EUROLEDSTORE specialists are happy to assist you with any questions you may have about LED panels. 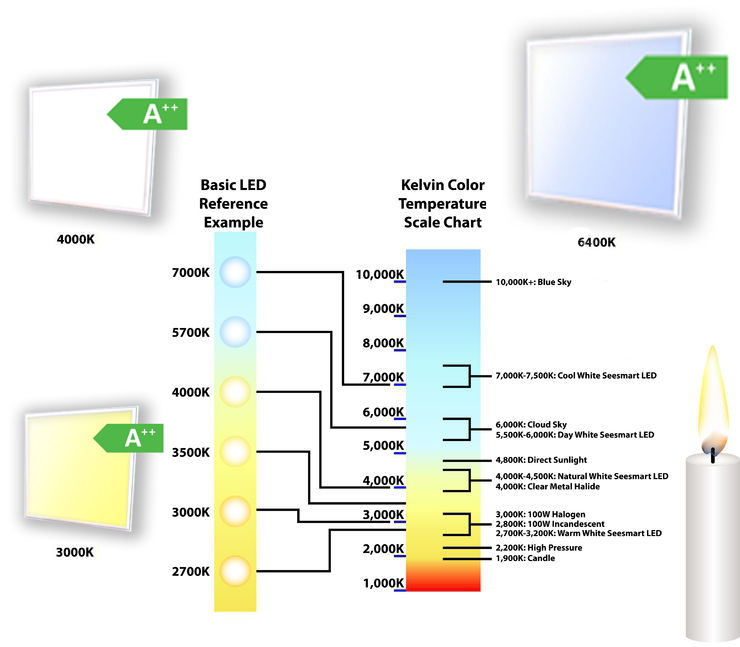 We can tell you exactly which LED panels are most suitable for your situation. For all your questions about LED panels, you can contact our customer service via the contact form on our website. The EUROLEDSTORE LED Specialists can also be reached during office hours via our live chat and at +31 (0) 452 03 10 95 or by e-mail at sales@EUROLEDSTORE.com . When placing an order for EUROLEDSTORE for the first time, it is useful to first create a user account . Then you can order the LED panels of your choice directly from us. Because our panels fall into the category A ++, this makes it very interesting for companies because these panels of this category can apply for an Energy Investment deduction. This deduction will give you up to 13.5% tax benefit when purchasing our LED panels. You can deduct 55% of the investment cost of the tax profit, in addition to your usual depreciation. Due to the very low consumption of 29 watts per panel and the very high light output of 3600 lumen, you have a very low consumption in relation to the amount of light that the panel gives. For more information on the Energy Investment Draw, please see more information on the website of the National Government for Entrepreneurs.